A unique Early Neothlithic settlement dating to about 5,800 BC has been discovered by a team of Bulgarian archaeologists led by Prof. Vasil Nikolov, who are conducting rescue excavations near the town of Mursalevo, Kocherinovo Municipality, in Southwest Bulgaria, along the route of the Struma Highway. 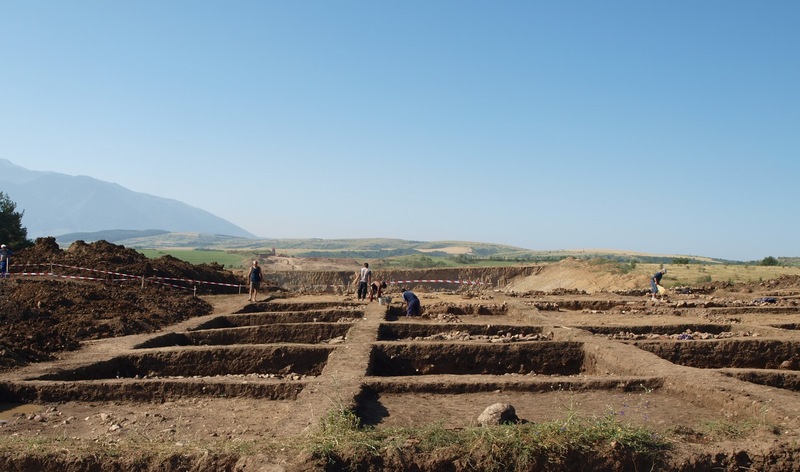 According to the archaeologists, the 8,000-year-old prehistoric settlement near Mursalevo in Bulgaria’s Blagoevgrad District looks as though it was constructed by modern-day planners and architects because of its perfect alignment, the Standart daily reports. “There is no other [prehistoric] settlement with such precise planning in the Southeast Europe. What’s really unseen before is that the buildings were erected an incredibly straight way. There is not a single building that’s awry," explains Nikolov, an archaeologist from the National Institute and Museum of Archaeology of the Bulgarian Academy of Sciences. The walls of the buildings at the Early Neolithic settlement near Mursalevo are made of plant stalks and clay, and are about 20 cm in width each. So far, the Bulgarian archaeologists have found about 20 prehistoric buildings but they believe there are probably twice as many. They also believe that the entire Early Neolithic settlement near Mursalevo perished in arson. “Back then people thought that houses have souls. They would even bury parts of them if their inhabitants have died in order to put “the evil" underground. The way [the houses] were charred shows that probably firewood was stocked inside them, and was then set on fire," Nikolov says. In addition to the prehistoric homes, his team has also excavated a Late Neolithic grave in which the corpse was laid in fetal position. A number of artifacts such as figurines, tools, and ceramic vessels have been discovered. The Bulgarian archaeologists have also found Antiquity traces of Ancient Thracian life on the same spot near Mursalevo. “It is curious that we have also discovered dozens of pits from the 5th-1st century BC, the time of Thracian Classic Antiquity. The Thracians built a sanctuary on top of the Neolithic settlement that they believed was sacred. In these pits, they carried out their rituals and sacrifices," Prof. Vasil Nikolov elaborates. His team of archaeologists is continuing its rescue excavations, which started in April 2014, along the route of the Struman Highway, a partially constructed road named after the Struma River, running through the Kresna Gorge, which will connect Bulgaria’s capital Sofia with the Kulata-Promachonas Border Corssing on Bulgaria’s border with Greece.